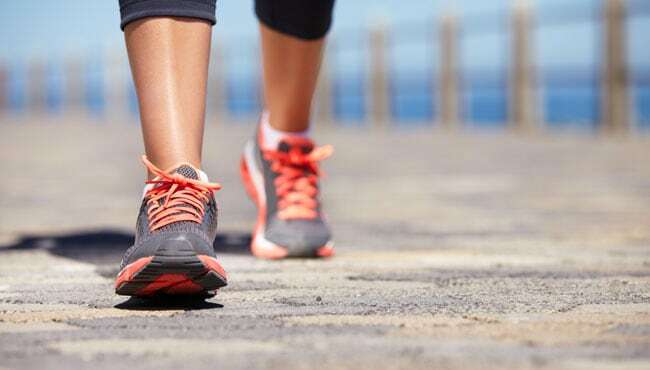 If you’ve got plantar fasciitis, you know the pain of walking around in the wrong shoes. Without the proper support, your feet are uncomfortable with every step. Chances are, you’ve found shoes or insoles to help combat the condition. But what do you do during the summer? If it’s hot out, bulky sneakers aren’t your best friend. But, regular flip flops hurt your feet. They’re flat and don’t have the support you need. After all, flip flops are designed to be lightweight, not supportive. Thankfully, the best flip flops for plantar fasciitis are out there! We’ve done some research into this new market, and compiled a list of some top options available online. Below, you’ll find full reviews of each sandal. We’ve judged them based on comfort, support, price, and online reviews. You’ll also find a list of Things To Think About as you shop at the end of the reviews. These best-selling sandals are from a leading brand in orthotic inserts and shoes. 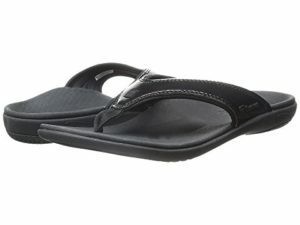 They combine a traditional flip-flop design with a supportive, cushioned footbed. Previous buyers loved the arch and heel support, which is much more prominent than on other flip flops. We particularly love how inconspicuous the added support is, which makes these sandals completely beach-friendly! They’re designed by experts. Orthaheel is a company specifically devoted to the production of orthotic footwear. The manufacturer says that their designers and podiatrists have worked together to come up with an ergonomic, biomechanical design for the footbed. The shape of the footbed, along with the deepened heel cup, helps to alight and support your feet properly. Many reviewers were pleased to find a supportive, orthotic option which still looked stylish. While there’s no hiding the strong arch support, these have a sleek, streamlined design which won’t look at all out of place on a fashionable boat party. They really do relieve the pain. Previous buyers were quick to say that the extra cushion and proper support made their P.F. symptoms a thing of the past. Many said the soles felt like getting a walking massage! The arch support is intense, and some people found it was too much for their feet. These aren’t the best choice for people who aren’t looking to correct low arches. They’re better suited to people with high arches, or people who are looking to really correct fallen arches. Some commented that they tend to run large. 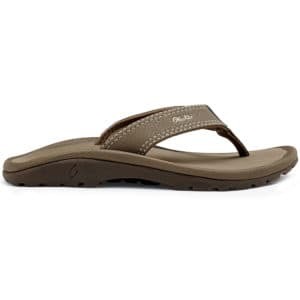 These women’s sandals have a sculpted orthotic footbed made from EVA foam and come in more than 36 style options. We like them because while most orthotic sandals can be fairly utilitarian, these are quite fashion-friendly and have plenty of options to choose from to match with any outfit. They’re lightweight, comfortable, and very durable. Previous buyers had great results resolving their P.F. symptoms with the Yumi’s! The EVA footbed is compression-molded to provide total foot support. This includes deep heel-cupping, orthotic arch support, and a metatarsal dome. We like the EVA material because it won’t wear out nearly as quickly as traditional foams. There are lots of color and style options. From simple to snazzy, you’re sure to find a pair that suits your style. Reviewers agreed–they’re effective and long-lasting. The EVA material doesn’t fall apart, and the straps are nice and secure. That’s particularly impressive given how short-lived many other flip-flops can be-even the more expensive podiatrist models. Some reviewers thought that the molded footbed placed too much emphasis on arch support. Again, these are orthotic sandals, so there’s more of a focus on correction than padding. Others thought that the compressed foam didn’t provide enough cushioning. They wished that the heel would have some more cushioning underneath the surface. The Olukai Ohana’s are a practical, simple solution for men with P.F. They’ve got a contoured footbed with strong arch support, and an elegant faux-leather strap. We like them because they’re more cushioned than some of the other orthotic options. Previous buyers said they felt like wearing sneakers, which makes them a great choice for lots of summer walking! The non-marking rubber outsole has added tread for traction on all surfaces and in wet environments. Reviewers said they were remarkably grippy. The compression-molded EVA footbed is designed to support an anatomically correct foot shape. It’s got strong arch support and a heel cup for better alignment. Plus, there’s plenty of cushioning. Previous buyers complimented the cushioning above all else, saying that the padding provided extra relief for their symptoms while their arches adjusted. In fact, they said that not only was the cushion more comfortable than other sandals, it was more comfortable than many shoes they had worn. 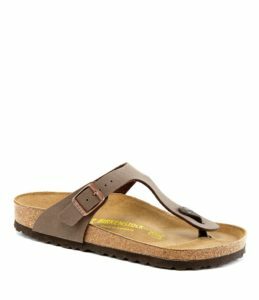 Birkenstock’s Arizona sandals are probably the most recognizable open-toe footwear on the market! They’re a unisex style for men and women, with a comfort factor that simply can’t be beat. If you’re looking for sandals that aren’t flip-flops, look no further! Birkenstock’s have the best footbeds we’ve ever tried for foot health, and they do wonders for plantar fasciitis. The patterned-tread rubber outsole provides good traction on most surfaces. It lasts a very long time, too. These can last for years of use, even if you wear them every day. They’ve earned themselves one of the best reputations on the market when it comes to foot health and comfort. Birkenstock’s unique footbed design has ample arch support, and deep heel cupping to promote proper gait and weight distribution. It takes pressure off your plantar fascia, and improves a lot of other foot conditions as well! They have a unique toe bar under the metatarsal area, which encourages your toes to grip and engage all your foot muscles, the way you naturally do when you’re walking barefoot on sand. The most important difference between the Birk footbed and the ones you’ve seen on our recommendations above is the material! Birkenstock’s have a distinctive cork and latex construction that’s all natural. The natural materials give you a lot of structure, but they also shape to your own foot profile as you break them in. So, after a month of wear, they become a personalized P.F. solution! Many people find that these sandals reduce knee and back pain as well as arch stress. They do an excellent job promoting proper core engagement, and the strong anatomical support keeps joints lined up. This reviewer has personally found that they’re superb for folks with previous ankle injuries. They don’t aggravate old muscle issues at all! You’ll find that these resolve a lot of issues related to foot alignment and health. The wide footbeds offer plenty of room for your feet to expand over the course of a day. You’ll see noticeable changes in pronation, as well as P.F. and foot pain. 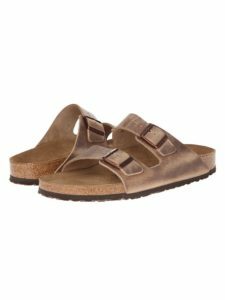 The Arizona style is Birkenstock’s most popular, so they offer tons of different color and material combos. There are leather and vegan strap options, as well as wide and narrow sizing options. They’re all made completely in Germany, to an outstanding degree of quality. There’s an adjustment period, and it’s a lot longer than EVA sandals. Plan to be breaking in your new Birk’s for as long as a month, depending on how often you wear them. They’re not necessarily uncomfortable during that period, but they certainly become less stiff the more you wear them. The pay-off is that the cork and latex footbeds become much more personalized the longer you wear them! These are pricey. Expect to pay as much as you would for a nice pair of shoes. It’s also important to make sure you’re buying from an authorized reseller! Birk’s are both expensive and popular, which is a recipe for knock-off’s. Be sure to get the real thing! You need to take care of the cork material, or it can go south fairly quickly. It’s not hard–just use a cork-proofing solution and try to avoid getting them soaked. A lot of people neglect the upkeep, though, which means their sandals don’t last nearly as long as they should. ***Want a worry-free waterproof version of these? Check out the Arizona EVA’s below! A fashionable option for women from Birkenstock! They’re as comfortable as the Arizona’s, but with a more elegant look. We like the classy, interwoven straps and more stylish finish options. These certainly don’t scream “therapeutic” from the outside! These are our top recommendation for women who want the best of both comfort and style. The Birkenstock Mayari’s have the same great footbeds as the Arizona’s above. They’re made with a combination cork and latex material, shaped to provide lots of arch support and heel relief. Like the Arizona’s, the Mayari’s help engage your foot muscles to promote natural, aligned gait. Thanks to the footbeds, they’re every bit as therapeutic as the Arizona’s for P.F. and other foot issues! These are the absolute best women can do for foot health in a sandal. These have a more stylish strap design for ladies who aren’t thrilled with the Arizona’s utilitarian look. The Mayari’s thinner, interwoven straps have a more delicate and refined aesthetic. These come in a variety of colors and finishes, in both leather and synthetic materials. There’s something for everybody! It’s a relief to have black patent and bedazzled straps, without having to hobble around in pain for hours. As with the Arizona’s, they’re high-quality and German-made. The Mayari’s are as pricey as the Arizona’s. Be certain you’re buying from a reputable vendor, too! Knock-off’s of these are as common as they are with the Arizona. The straps on these aren’t as universally comfortable as the Arizona’s. Depending on the size of your toes, you may or may not enjoy the thong design up front. Our final sandal recommendation for those with P.F. 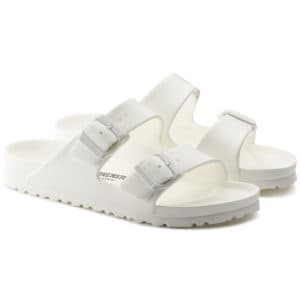 is Birkenstock’s EVA version of the popular Arizona sandal. We’ve recommended the normal cork models above, but these EVA’s are some of the best new things on the footwear market. We’ll let you in on a little secret: much as we love the cork models, we’ve ended up wearing these more regularly, since they’re so low-maintenance! They’re our top comfort recommendation for anyone who wants a water-friendly pair that will solve foot health issues. Plus, for high-quality German-made sandals, they’re dirt-cheap! They’re all EVA. Normal Birk’s are great, but they can be a bit of a pain to maintain. Plus, you have to be careful to avoid getting them very wet. That’s one reason they’re less than ideal for swimming and gardening. EVA is completely water-friendly! You can hose these down, take them in the lake, and wear the poolside. While EVA doesn’t quite personalize itself the way cork does, it still feels great. The footbeds on these are shaped exactly the same as the standard Arizona’s, so they’re equally good for resolving P.F. They have a deep heel cup, prominent arch support, and a metatarsal ridge–just like normal Birk’s. One benefit of EVA over cork: it breaks in much faster. That’s why these start feeling cozy in just a few days, as opposed to weeks. It’s still very resilient, though, and keeps its springiness for a long time. They’re extremely durable. This reviewer’s been using these pretty much every day for around the house and working in the garden, plus a trip to the Caribbean and some lake adventures. The first pair still hasn’t bit the dust, even a year and a half later! Given that impressive longevity, these Birk’s are an incredible bargain. They’re a fraction of the price of the standard cork models, and close to the cheapest things here. You can get them in black, khaki, navy, or one of many bright color options! They’re still made in Germany! These are very comfy and supportive, but not as awesome as the cork models. They don’t shape as well to your feet, even though the footbed is pretty unbeatable among water-friendly options. They’re also not as good-looking as standard Birk’s. The colors are fun, and the blacks look very much like black Arizona’s, but no EVA sandal can really compare to leather up close. The key to plantar fasciitis relief is good arch support. Look for sandals with a pronounced arch. It should extend to about halfway across the foot to provide proper support. Think of arch support as a mound, rather than a small bump just inside your foot. This is why so many sandals are so dreadful for your feet! They don’t include any arch support at all, let alone cushioning! Without it, they aggravate your plantar fascia and cause endless foot paint. They’re also doing a number on your joints and back by failing to promote proper posture. Beyond arch support, the best sandals have deep heel cups, which help balance weight evenly, and focus your stride on the heel. Many heeled sandals and shoes cause pain by aiming weight toward the arch and forefoot, when it’s anatomically designed to rest toward the backs of your feet. You might also find metatarsal domes or raised metatarsal ridges in the forefoot of the soles. These are signature features of Birkenstock’s. We find that they’re extremely effective, since they get your feet to move in much the same way that they would if you were walking in sand. You end up using all the foot muscles the way they evolved to work! All of these features can help alleviate pressure as you walk. Remember: the best sandals are those which give you a supported version of the natural human gait! So, they should be supportive, correct wobble, and promote proper weight distribution. And, of course, you’ll want some cushion. Look for sandals with EVA foam footbeds, latex cushioning, or other padding to make walking more comfortable for you. You shouldn’t have to sacrifice looks for comfort. Naturally, supportive sandals will have thicker soles. They won’t look as sleek as normal flip flops. But there are plenty of options available that look refined, elegant, and stylish. Many models are available with leather straps or detailing. Synthetic options also come in a wide range of colors and finishes, and are a great way to have a fun style while still being waterproof. Depending on where you’ll be going, you’ll want different features from your sandals. If you’ll be going on uneven terrain, you might want something with straps over your foot, instead of a flip-flop design. If you’ll be near water, you may want something waterproof or at least water resistant. Leather sandals won’t be so good for getting wet. And if you’re walking on wet surfaces, you might also want to look for something with better traction. Some of our picks are quite expensive–they’ll cost as much as a good pair of shoes. If you’re not going to be wearing sandals for much of the year, you might want to think about one of the less expensive options. However, if you live in a warm area, or will be wearing sandals for a good portion of the year, it’s probably worth investing in a really good pair. Think about how much time you’ll be spending in your new sandals. And remember–it’s worth paying a bit more for some really nice sandals that’ll last you a long time. Now, that you’ve seen some of your options for supportive, corrective sandals, which one should you choose? Well, it really depends on your needs; activities, lifestyle, etc. If you need a strong arch support and heavy cushioning, the Orthaheel Tide’s are available for both men and women. They’re designed by podiatrists and are very popular among fellow plantar fasciitis sufferers. The Birkenstock Arizona’s are a great water-friendly solution for women and men, mixing the comfort of an anatomical footbed with the practicality of strong tread and waterproof uppers. They’re also very inexpensive! For the full Birkenstock experience, we recommend the cork and latex Arizona’s. They’ve also got strong support and are stylish enough to blend in with any other hip sandals around town. If you need a milder solution or want something a little more low-profile, the Spenco Yumis for women provide a decent molded footbed with less volume than the Birk’s. They’re a bit closer to a normal flip-flop and come in lots of different looks. Men who want something similar should go for the Olukai Ohana’s. 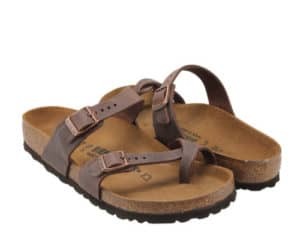 And for those ladies in search of fashionable but practical sandals, the Birkenstock Mayari’s are designed so as to provide a therapeutic feel without anyone noticing the difference from the outside. We love all these sandals, however we think the very best sandals for plantar fasciitis are the Orthaheel Tide thanks to their inconspicuous support and beach-ready style! If you’re interested in more of our choices for the best shoes for plantar fasciitis available online, check out our other handy guides!